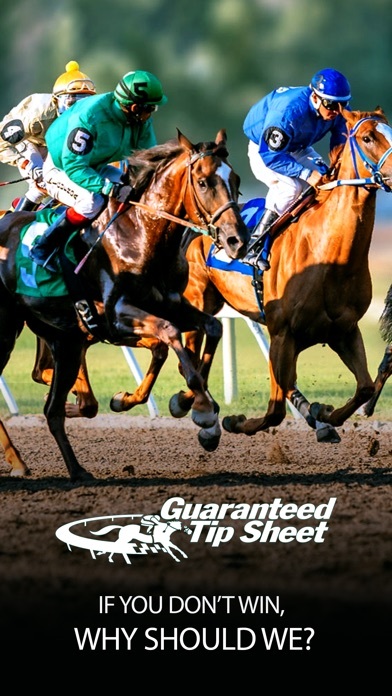 Guaranteed Tip Sheet featuring Horse Racing Radar provides horse racing tips and picks for most North American thoroughbred and quarterhorse racetracks. 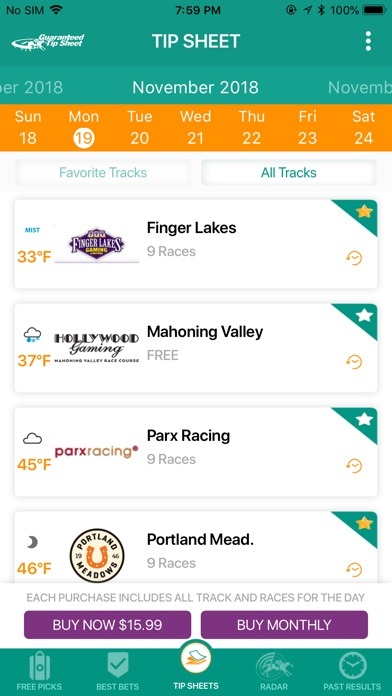 Through our app you can view our picks for each race, see our daily BEST BETS and view our entire past history of tipsheets and results. Brand new 2.0 brings many new features and improves all facets of the app. 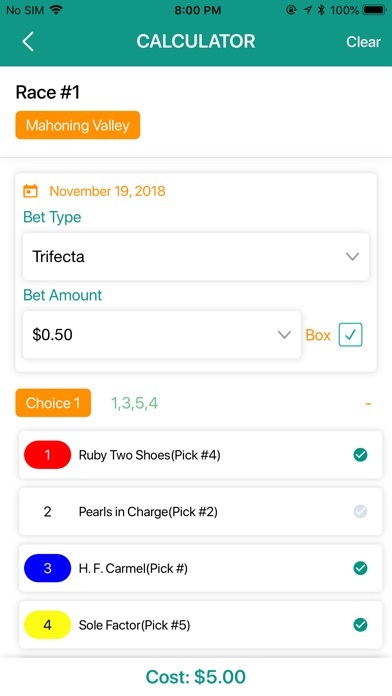 Guaranteed Tip Sheet provides: One FREE track daily Top 6 picks for each track Choose and display your favorite tracks Daily BEST BETS for each track Past results for each track handicapped Wagering calculator built-in (standard and Dutch) *NEW! Easier to read and use graphical interface optimized for phone and tablets *NEW! Displays weather conditions and local temperature for each track *NEW! Each race graphically displays track surface (dirt, turf, all weather) *NEW! Choose Flip or Scroll type tipsheet view *NEW! Share-A-Sheet – Share your tipsheet purchase with a friend at no additional cost *NEW! Mark favorites and see track history directly from tipsheet and BEST BET screens *NEW! List tracks by geo-location, those physically closest to you are listed first if you choose *NEW! Fingerprint unlock option added *NEW! Choose to keep screen turned on and not sleep when app is in use *NEW! 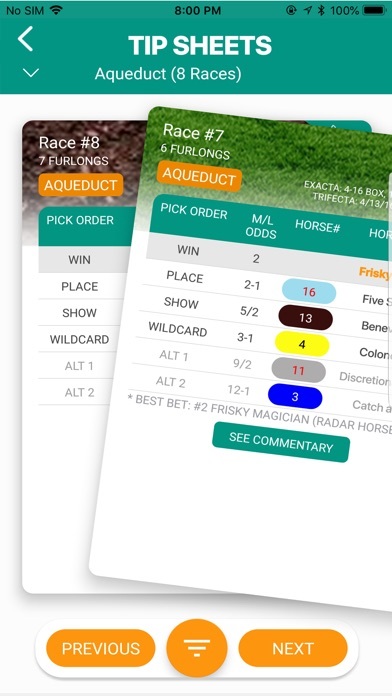 News from Horse Racing Radar built into the app *NEW! See and track our “RADAR HORSES” directly within the app *NEW! Radar Horse commentary viewable within the app *NEW! See graph of our top performing tracks over the last 14 days *NEW! See graph of top performing BEST BET tracks *NEW! Desktop widget that shows the top performing tracks over the last 14 days *NEW! Dutch wagering calculator added Online since 2009, Guaranteed Tip Sheet is a featured handicapper for Gaming Today, Horse Racing Nation, Predict’Em and other high profile racing sites. Come see why trusted racing publications and serious horseplayers from around the country choose Guaranteed Tip Sheet as their preferred handicapper. Lower prices. Higher payouts. GUARANTEED. NOV 19, 2018 - RELEASE UPDATE: Major release of version 5.2.